Christian Coptic deaf school in Cairo is a boarding school, and the children sleep and live there separated from their families. We follow Asma and the 1st class during their hard work of learning to speak and to do sign language. They come from the very poorest areas of Cairo. The Coptic Church gives them a place to live, provides them with food, clothes and a possibility to communicate with the world around them. 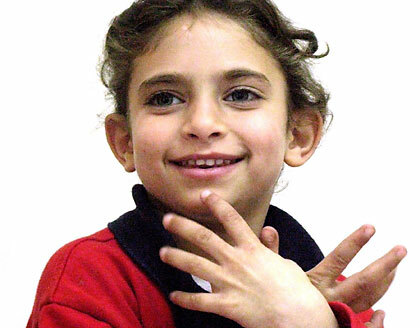 Asma and her classmates are working very hard everyday to learn to speak and do sign language. If they do not learn to communicate and speak they are lost in the Egyptian society and might not get a job in the future. No job, no money and then no food and possibility to live a life away from the streets. At the boarding school the children find friends and caring adults. Even though there is a very warm and friendly atmosphere at the school and church, the children also meet the difficulties of being away from their parents. They find a way to deal with the problems themselves and to live a life in silence - in a world full of sounds. 2005 - 2009 - Student at The National Film School of Denmark, Documentary Director. 2000 - 2003 - Student at The Danish Design School, Production Design. 2003 – Without Words, short film.